Ophthalmology is the branch of medicine that deals with study of anatomy, physiology, disease and treatment of eye related problems. These problems like glaucoma, near­sightedness, far­sightedness, blindness, cataracts and macular degeneration through the use of surgery or laser technology. Globally, it is estimated that approx. 1.3 billion people live with some form of distance or near vision impairment. Around 48% of world population is blind because of cataract and more than 60 million people suffer from glaucoma and it is estimated that the number would rise to 80 million by the end of 2020. Ageing population is the leading cause for refractive error problem in countries like the USA and Europe. The majority of people with vision impairment are over the age of 50 AND 80% of all vision impairment is considered avoidable. Ophthalmology market is mainly divided in to four segments viz, surgical devices, diagnostic and monitoring devices, vision care and ophthalmic drugs. Ophthalmology 2019 enhances ophthalmic education to improve eye care Institutes like (NIE, Wilmer are involved) Contribute to preservation and restoration of vision around the world. Ophthalmology continues to be an attractive field of medicine with great opportunities. The global ophthalmic lasers market is expected to rise with the compound annual growth rate (CAGR) of about 5% during the forecast period 2016-2024. Chronic diseases such as diabetes contribute to the raising growth of global ophthalmic lasers market during the forecast period. 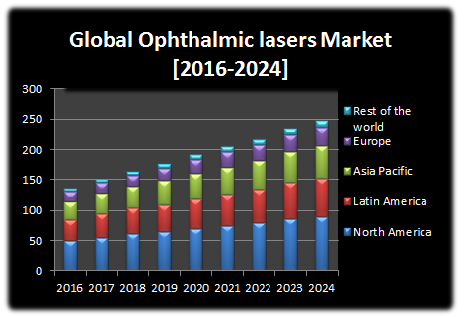 The high cost of equipment, therapy and availability of alternative therapies for the treatment of eye related diseases are some of the major factors preventive the growth of the global ophthalmic lasers market during the forecast period. The global ophthalmic lasers market report has been divided into North America, Asia Pacific, Europe, and Rest of the World. It is expected that North America held the largest market revenue share for the ophthalmic lasers market in 2016. However, Asia Pacific is probable to be the fastest growing region in the ophthalmic lasers market during the forecast period due to increasing prevalence of cataract removal surgeries and increasing awareness for the prevention of blindness. There are various major players such as Abbott and Afimmune (Ireland), Ellex Medical Lasers Limited (Australia), Optotek Medical (Slovenia), Abbott Medical Optics, Inc. (United States), Alcon Laboratories, Inc. (United States), Valeant Pharmaceuticals International, Inc. (Canada), etc. which helps in the growth of global ophthalmic lasers market. The report on the global ophthalmic lasers market is divided on the basis of product, applications and end ophthalmic users. Product segment is divided as diode lasers, excimer lasers, and femtosecond lasers. Application segment of global ophthalmic lasers market is divided as AMD treatment, cataract removal, diabetic retinopathy treatment, glaucoma treatment, refractive error corrections and other applications. End users adopting ophthalmic lasers are divided as ambulatory surgical centers, hospitals and ophthalmic clinics.